Mondial President Jeannine Marois announces winners in the MBeer contest with Festival Director Luana Cloper and Competition Director Marilou Caty. The Mondial de la Biere festival in Rio de Janeiro continues to be a colorful collection and reflection of Brazil’s fast-growing craft beer culture. The festival, recruited from its Montreal origins by Fagga/GL Events, has evolved from its debut six years ago into 5-day food, beer and music extravaganza – but mostly beer. Alice, er I mean Elluar Souza with Curiouser and Curiouser, an American IPA, from the Wonderland Brewery. This year’s selections were truly staggering. Brazilian brewers are hard-wired into the global network that craft beer has become. There were several sightings of Brut IPA (or DryPA), new style that just appeared this year in the US, as brewers here all want to try the new thing. 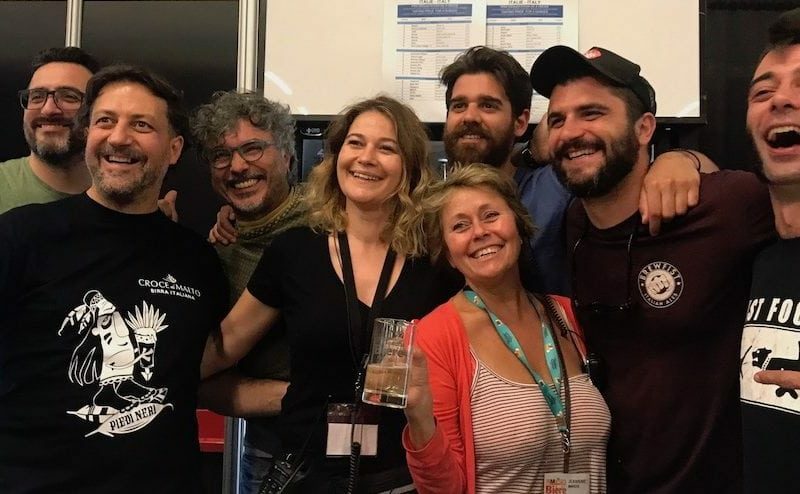 Each year Mondial de la Biere President Jeannine Marois brings her team to Rio to run the MBeer blind judging competition and to represent the show (disclosure – I was the reserve judge this year, but the panelists, seven men and five women made it through the 2-day program unscathed). After the competition results are announced the team walks the floor presenting winners with large medallions to hang in their booths – you can bet the winning beers don’t make it to the fest’s last day. Marois is treated as a celebrity in the Rio beer world; everywhere she goes brewers thank her for bringing the long-running festival to Rio. The festival runs through three large halls on Pier Maua with an outside promenade looking onto the Rio harbor offering seating, two stages, and a couple dozen food trucks featuring burgers, pork, tapioca, empanadas, pastries, chocolate and other Brazilian treats like Coxhinas (fried croquettes stuffed with chicken or codfish). Collaborations are very much in vogue. Motim, a local brewery that just opened a bar in Copacabana, brewed a Catherina Sour with lime and graviola, a sour Brazilian fruit. Collabs are not just between Rio’s ubiquitous gypsy brewers but between large and small. Eisenbahn, a large established brewery from the south, also poured Coza Linda which dabbles in wild fermentation and Way which specializes in sour beers. Jokers are wild at Teresopolis Brewery, Bodebrown featuring three different But IPAs and Antuerpia, winners of the platinum medal. One hall was anchored by two of the larger craft breweries, the iconic Bodebrown brewery from the town of Curitiba, south of Rio in the state of Parana. Curitiba itself is something of a brewing hotspot, now home to 35 breweries. Bodebrown brought three different Brut IPAs featuring single hop treatments – Mosaic, El Dorado and Galaxy; they were proudly touting their 19 Mondial de la Biere medals from both Montreal and Brazil – make that 21 as this year they earned golds for Regina Sour Framboesa and Cacau IPA barrel aged (originally brewed with Stone Brewing). Antuerpia from the neighboring state of Minas Gerais bested them this year by taking the single platinum medal for their Nikita Cherry Hickey imperial stout. This brewery used to be the home for many of Rio’s original gypsy brewers, but many have moved to newer, smaller more specialized facilities, leaving Antuerpia to pursue their own brands – which they have done to great effect. This year they offered 22 selections. Head brewer Giancarlo Vitale said that at one time 60% of the gypsy brewers at Mondial brewed at his facility. I asked Giancarlo, who has been brewing since he was a teenager, if he learned much from the gypsies. He said, “Yes, but they learned more.” Antuerpia is also known for hosting pre-festival parties, highlighting a new release. Last year it was the launch of their New England IPA, named Vermont, in cans. This year they poured sours and Brut IPA at their newly-opened Churrascaria restaurant in Ipanema. Ana Claudia Pampillon of the Rio Beer Road with Pontal Brewery. Rota de Cerveja, spearheaded by Anna Claudia Pampillon, brought a dozen of their 24 members. The Road of Beer winds through the mountains of Rio – through the towns of Petropolis and Teresopolis, built by the Portuguese royalty to escape Rio’s summer heat, and Nueva Friborgo, populated by Swiss settlers. The area became home to two large brewing groups – Grupo Petropolis and Teresopolis, and is now a populated with many new brewpubs and microbreweries. Grupo Petropolis, known for their mega label Itaipava, poured selections from their Black Princess band as well as German Weltenburg which they brew under contract. Once wary of craft brewers, the brewing giant has now embraced the movement. 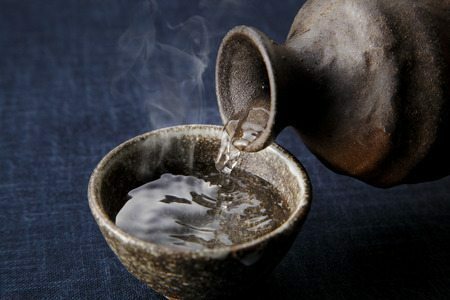 Led by jovial Brewmaster Ruddiger Gortz, they have installed a nanobrewery for educational purposes and have extended an open invitation to Rota breweries for collaboration and experimentation. Some of the local breweries were missing this year – notably three first-wave gypsy brewers: Hocus Pocus, 3 Cariocas and Three Monkeys – leading to rumors of conspiracy, but 3 Cariocas brewer Joao, who was in attendance most days of the fest and also judged, said that they had just been too busy brewing enough beer for the recent opening of their bar in Botafogo area of Rio. (A few days after the fest they reached a crowdfunding goal of $R2 million [about $250,000 U.S.] to begin building their own brewery. Rising star, Quatro Graus brewery. There were many new breweries to step into the breach however, some that may have piggybacked on other booths in previous years, but now have the resources for their own. Among those that impressed were Quatro Graus, who’s motto, In Science We Trust led them through research to combine lager and ale yeast to make Better Together – my first Double IPA Lager. Also, Tastes Like Birthday, a milk stout with Avela (hazlenut), and a barleywine collab with Dutch brewery De Molen with two Brazilian woods, Amburana and Cumaru. Thirsty Hawks Farm Brewery, not a farm brewery in the US sense (the brewer’s family owns a farm) won a gold medal for their gin-barrel aged Ginga de la Boe; they also poured Old Bogdan a barrel-aged quad sour and Libidinosa, a double iced doppelbock at an astonishing 30% abv. It’s impossible to list the 150 or so breweries large and small represented: newcomer, Ekaut, made the trip from the northern city of Recife. A trio from Sao Paulo: Davida, meaning Dragonfly (gold for Brewer’s Cut, American Sour), Doktor Brau (winners of two gold medals for their Double IPAs at the Mondial Sao Paulo) and Hator; some who made the trip to Mondial Montreal this year – W Katz, Rockbird and Overhop (gold, Aternum, imperial stout), now partnered with regional brewer Mistura Classica (gold, Catherina Sour Guava); Alice-themed Wonderland (gold, Gone Mad, American IPA); some cutting edge grouped with the Underground co-op, Hop Lab (great Rauch beer) and Infected brewery, wild experimentation; and Maniacs brewery, which also imports Brooklyn brands. Stone was there with another importer while festival regular Waldemar Stocco of Belgian import specialist Meara was plying cocktails made with two types of his own gin. A games area, a tattoo parlor, photo op props and Inside Food and Beer live studio were just some of the other features. You definitely need more than one day to digest this fest – see you there next year, Sept. 4-8. 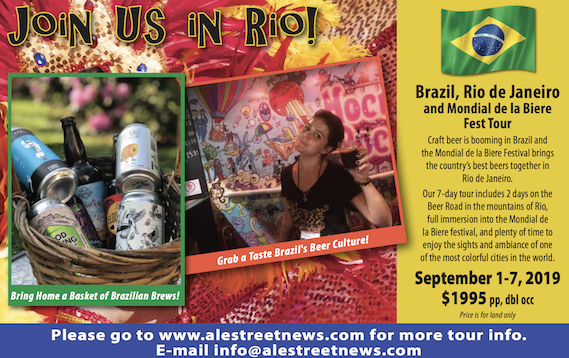 Jump on the Ale Street News Tour to Rio de Janeiro 2019.